Shed Siding FAQ – I get asked a lot of questions about Shed Siding and so I have pulled these together onto one page for you to browse. Hopefully, you can find an answer to your question in amongst these. Return to Shed siding questions. My shed t&g siding just seep in water at one lower corner. It is on the weather side and I need to prevent any further water ingress. It must hold up against full sun and rain. Must also be easy to install and last the course. Hope you can help.. The typical detail that is used at corners is as shown below. This is fairly standard and so should prevent most wind-driven rain. The next level up from this would be to install a membrane as a second line of defence behind the t&g siding. The membrane should be breathable so that water can escape from the building and is not trapped in little pockets. Which would cause localised rotting of timbers. I'm building a simple 8'x10' storage shed. What are your thoughts on using Hardiboard(4'x8' sheets) that have the stucco appearance as opposed to standard T34 siding wood siding? I'm also curious as to building an attractive but simple single door 42"-48" wide if I use the Hardiboard? In relation to your question about using Hardiboard or T34 siding. So really we are looking at the pros and cons of a fibre-cement siding system versus timber panel based. 4. And of course Cost. Appearance. Fibre-cement siding is now very realistic in appearance and with a coat of paint I think you would be pushed to tell the difference between it and T34 siding even close up. Workability. Timber – straight forward. Fibre-cement – Tricky! Various methods range from scoring it and snapping to using a disc cutter (very dusty). The various methods are covered in more detail in the product information sheet on the James Hardie website. Durability. Timber if well primed and painted is quite durable (remember to prime and paint any cut edges prior to assembly). Fibre-cement is almost indestructible (resistant to chemicals, termites, moisture etc etc! Cost – you are probably best placed to assess this as I am based on the other side of the pond in the UK. At the end of the day the influencer for me would be how much cutting for windows doors, vents etc there is and the confidence you have in working with sheet fibre-cement. If you wanted to use the fibre cement panel for the door you would have to use a full door frame behind it (not just the ledged and braced door that I show as a typical door on the site.) This is because the Hardiboard would only act as a cladding material over the frame and not as part of the structure as in the ledged and braced door. I hope that this has been of use, if you have any more questions we can continue the conversation using the comment form below. Hi John, I'm building a shed this summer (can't wait!). I want to have a high-performance wall i.e. plywood sheathing, breathable membrane, cladding. Should I nail the cladding directly onto the breathable membrane or attach battens or firring strips for the cladding? Thanks for your question. You are right that you would nail timber strips on to the outside of the breathable membrane. The timber strips should be about 1 1/2" x 3/4" treated timber as they will in a damp environment. The purpose of spacing the cladding off the wall is to allow air flow behind the cladding timber and stop the accumulation of moisture which would occur if the timber cladding was nailed directly to the membrane. Also, remember to put wire mesh insect screen at the bottom to prevent insects getting into the void. Best of luck with your project, let us know how you get on and of course feel free to ask any more questions as you go along. When building a vinyl sided lean-to shed against a vinyl sided garage wall, how do you attach the shed roof to the wall so no water goes between the garage and shed and what do you do about the gaps along the attached walls? The way to overcome this problem is to treat the lean-to as you would an extension to your house/garage. Vinyl siding companies produce a wide range of profiles for overcoming most situations. Standard profiles to ensure the area between lean-to stay dry and mould free are the internal corner post and the roof flashing piece. Both of these components should be available to be compatible with your existing vinyl siding system. You would cut and remove the siding from the area that you are going to build the new lean-to. The gaps between the new and existing siding would then be closed using the profiles mentioned above. We are considering using decking boards to make our shed - is there an issue with this? Have scoured the Internet for advice but the can only find info for Tongue and Groove and feather edge boards. Also, my husband is planning to fix them vertically, rather than horizontally; is there a reason timber tends to be fixed horizontally? The sketch below should answer the first part of your question. The purpose of the profile of feather-edge, shiplap and tongue + groove cladding is to act like overlapping fish scales and not allow water to accumulate on the outside of the shed. 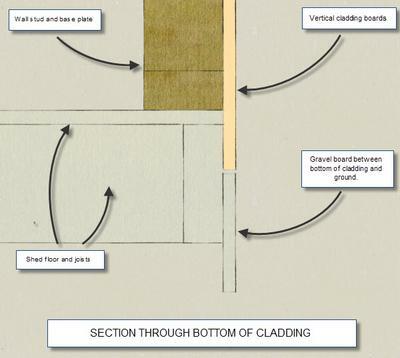 As you can see from the right-hand image when square edged boards are fixed horizontally the provide a ledge where water and moisture can stay. This eventually will lead to the boards decaying. For the second part of your question. There is no reason why the boards shouldn’t run vertically. In contrast to the first part of the question. When the board run vertically there is nowhere for rainwater to collect. This is good. The gaps between the boards need to be waterproofed in some way. This could be a timber batten nailed on top of the gap between the boards to block wind-driven rain. Or it could a breathable membrane behind the cladding line, as on the image below. Most commercial sheds have horizontal cladding for the simple reason that the main structural components of the shed wall run vertically. The easiest and cheapest, way to fix cladding is to run it horizontally. However, if you are building your own shed and already have the decking boards then fixing some noggins between the studs to enable you to get the effect you want will only take a small amount of extra time and the cost will be tiny in the scale of the project. One detail to be aware of is the detail at the bottom of the shed wall. The vertical board should overlap the floor to keep this area waterproof. But stop the boards short of the ground and use a ‘gravel board’ to fill the gap between the ground and the bottom of the boards. The reason for this is that the internal structure of timber is like a bundle of tubes. If this is in contact with the ground or near the ground it will ‘wick’ up and hold water. Over time this will initiate rot in the bottom of the cladding. The way I have shown is to have a horizontal gravel board which can be replaced every so often, just like a cars tyres. I understand that the vinyl siding will cover the sheathing and come down as far as the sheathing on the sill plate. Can you tell me how far down the sheathing should come down on the bottom sill plate? Can I just start the sheathing where the bottom plate is or do I need to cover the sill plate or at least some of the sill plate with the sheathing and the vinyl siding? 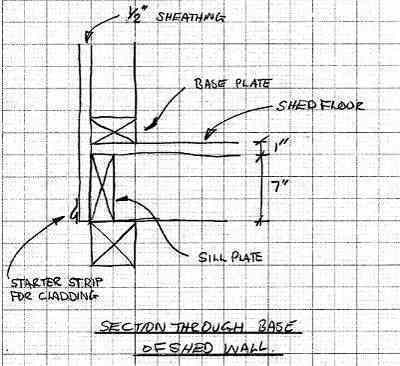 I am building a shed and I want to have 8-foot walls. 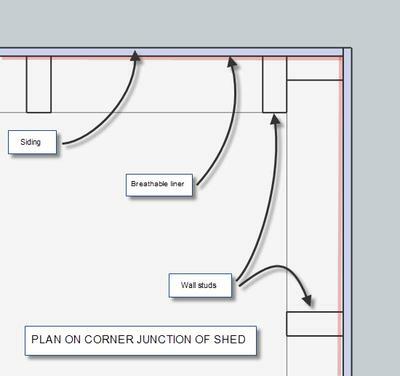 I could not find any plans for a shed with 8-foot walls and vinyl siding so I am modifying the plans that I found for a 7-foot shed with t111 wood siding. I am using 2 x 6 pressure treated sill plates and I am trying to determine where to start the sheathing. Since the sheathing comes in 4' x 8' panels if I start the sheathing over the sill plate then should I cut a small piece of sheathing to compensate for the lowering of the full panel on the sill plate? If so where should I install the small piece of sheathing? I think that a picture is worth a thousand words so I hope that the sketch below answers your question. The sheathing should be continued over base plate and the sill plate. This protects the sill plate from water and sunlight for long-term durability. The vinyl siding will be started with a starter strip or a starter strip and metal flashing (dependant upon the system that you use) right at the bottom of the sheathing. Make sure that the bottom edge of the sheathing is protected as this is an area that water can collect and rot the sheathing if not installed as per the system specification. With respect to the wall height, with this arrangement, you will get a wall height of 7’ 5” using the standard 8’ sheet. If it is absolutely critical that you achieve the 8’ wall height then you will need to have some 7” strips at the top. 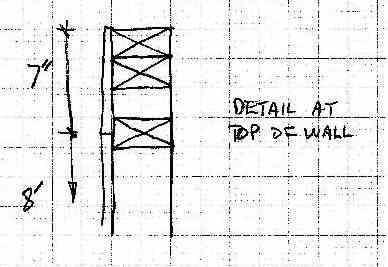 The joint between the two sections of sheathing should be backed by some noggins as shown on my second sketch to provide some support to the sheathing. Let me know how you get on, more questions welcome as usual and progress photos are always welcome. Is the bottom of the plywood sheeting exposed in this case? How is it to be protected from water and insects? To use a shed lining membrane or not? 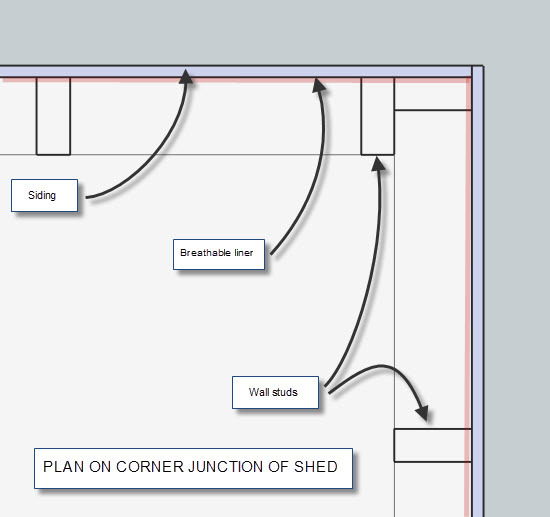 I am designing a shed (5m x 3.5m) which I am going to use feather edge boards on. So the question is.... should I lay a weatherproof layer over the stud wall before applying the feather edge? If so can I use polythene sheet or should I use a breathable membrane? The shed is for general use but I want it to be waterproof. Your thoughts are most welcomed. I would definitely use a breathable membrane. 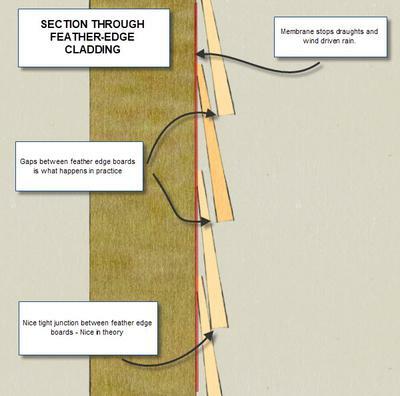 When using feather edge boards there is no ‘interlock’ between the boards such as you get with shiplap or matchboard. This means that if (when) the boards warp that an air gap will be created between them. Making the inside of the shed draughty. The membrane behind the boards will significantly reduce the draughts and air loss from the shed. It is important to have a breathable membrane. A non-breathable membrane such as polythene will allow moisture to build up inside the shed making the inside unnecessarily humid. Also, any moisture trapped between the polythene and the timber would cause localised rotting of the timber. The membrane is secured by stapling it to the timber stud frame before nailing the boards in position. I am currently planning a big build after years of messing with small sheds. I am building a shed for storage of a very expensive quad bike with several snap on tool boxes and music equipment. I was just trying to find out your opinion on my wall structures. To make it secure from thieves I was going to line the outside of the shed with ship lap then insulation with a steel checkerplate finish on the inside as thieves in Suffolk have been cutting through shiplap and stealing goods. I know this won't stop them breaking in but will create enough noise to at least get noticed. I would like to hear if you like the idea or possibly have a better idea. Thank you for your question. The idea of having an inner skin of metal inside the framework is a good one. I have a few other ideas and questions that may help you refine your design. Essentially you are creating a metal shed inside a timber shed. The timber is for a good appearance and to blend in, while the steel is for security. What thickness of metal checker plate are you using? The highest security mainstream metal shed on the market is the Asgard range and these are made of metal 1.2mm thick. Another option is to use a recycled metal shipping container which are available secondhand and in a range of lengths. Shipping containers are often converted to stores and site offices where a high level of security is required. Both of these options could be covered in timber cladding and made to blend in if required. Other options for beefing up the security of a more standard shed would be to use a layer of expanded metal (Expamet) or weldmesh reinforcement in a similar way to the way you propose with the checker plate. These both have the advantage of being easier to fix to the framework and would require heavy cutting equipment to get through them. Expamet and weldmesh do have the disadvantage that they would not be a solid barrier as the checker plate would be. Once you have the physical barriers in place some electronic measures such as shed alarms and motion sensors that would alert you when there was activity around the shed is another avenue to follow. I hope this is of use, let me know if you have any more ideas and the solution that you finally adopt. A neighbour of mine has got an old steel container that he keeps in his field to house his tractor. He has, at the request of the local council clad it in timber. In truth, it still looks like a cargo container because of the dimensions, but because it is behind some trees it blends in. The sort of way elephants hide in long grass. Although the steel will stop the thieves hacking their way in - the camouflage is probably the best thing, as he still only has a fairly standard pad-lock on the doors - which could be taken off with normal bolt cutters.